A solenoids valve is a control element system used in various industries as a control unit when electric energy passes through it. It either shuts off or allows the fluid flow. Based on the demand of the industry and the performance requirements, the solenoid valves are available in different shapes and sizes. The valves are also made available based on the operating speed and reliability. They find a wide range of applications, ranging from washing machines to the satellites. Growing investment in various industries, as well as the increasing government regulations on industries such as oil and gas, power generation and others across developing economies such as India and China, are the major driving factors for the market. The new developments in explosion-proof, drip-proof, and other types of direct and indirect solenoid valve products have boosted the market further. The Solenoid Valves Market is estimated to grow at a CAGR of 3.8% during the forecast period 2018–2023 owing to the growing need for high-quality potable water; increasing technological advancements in the chemical, and food and beverages industries; and the declining cost of components and solutions. According to IndustryARC findings, the solenoid valves market is experiencing a rapid upsurge owing to the increasing automation and the integration of IoT and AI technology in the entire value chain. Rising urbanization and increasing awareness about flow control will catalyze the growth of the market in the APAC and Americas regions. The Solenoid Valves Market report comprises of pricing analysis for different types of solenoid valves and applications used in the market. 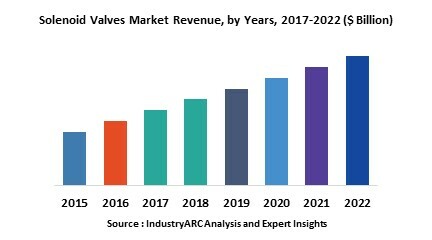 The increased incorporation of valves in different phases of the extraction process in the chemical and petrochemical industries could be a major driver for the market. The continuous retrofitting works in the aforementioned industries would significantly propel the market. Moreover, the growing need for automation in the power industry is expected to drive the market during the forecast period. Solenoid valves are important components to the power generation industry, and so the increasing investment in expanding power generation capacity will also be a market driving factor. Various economic, environmental, political, and social factors are affecting the price of solenoid valves. Furthermore, the slump in oil & gas prices and the increase in decommissioning of thermal power generation plants are greatly affecting the solenoid valves market. The base year of the study is 2017, with forecast done up to 2023. The study presents a thorough analysis of the competitive landscape, taking into account the market shares of the leading companies. It also provides information on unit shipments. These provide the key market participants with the necessary business intelligence and help them understand the future of the Solenoid Valves Market. The assessment includes the forecast, an overview of the competitive structure, the market shares of the competitors, as well as the market trends, market demands, market drivers, market challenges, and product analysis. The market drivers and restraints have been assessed to fathom their impact over the forecast period. This report further identifies the key opportunities for growth while also detailing the key challenges and possible threats. The key areas of focus include the types of solenoid valves and their specific applications in different industries. Christian Bürkert GmbH, headquartered in Germany, is analyzed to be a leading player of the Solenoid Valves Market. Christian Burkert is a leading manufacturer of control and measurement systems for liquid and gases. It offers a wide range of Solenoid Valves. Some of the other key players mentioned in this report are Asco Valves, Pentair Ltd., Parker Hannifin, Curtiss-Wright, Danfoss A/S, and so on. In 2017, Pentair Plc, a water treatment company that designs and manufactures valves and actuators, merged with Emerson Electric Company, a leading player in the industry that supplies products for industrial automation, process management, network power, and commercial solutions. In one of its contracts in China, Rotork fitted ELB units into gas-over-pipeline actuators for line break monitoring. The task of the ELB units is to allow the operator to monitor the running condition of the gas pipeline and the status of the valves. The ELB units are provided with an array of programmable alarm and alert indicators, which can help the operator close the appropriate valves. 1. Is the market for Solenoid Valves growing? How long will it continue to grow and at what rate? 2. Which type of Solenoid Valve presents the major growth opportunities? 6. What is the current status of the Solenoid Valves market in different countries? 7. Which are the major relevant product segments within solenoid valves? 8. Which industry will witness heavy adoption of solenoid valves in the near future? 11. What are the short-term, medium-term, and long-term opportunities for the market? 16. What is the futuristic scenario for the adoption of solenoid valves? The Solenoid Valves Market size is evaluated based on the number of products per organization type along with the varying price points pertaining to specific applications. These were identified as key informational conjectures for market estimation in 2017/2018. The Solenoid Valves Market share is thoroughly checked against all data points that have been incorporated and rechecked against various data sources. Various C-level executives and key opinion leaders are contacted for verification of the data. The Solenoid Valves Market forecast and growth rate are achieved by applying the time series forecasting methodology on the various factors. The market forecast and growth rate are further backed with historical trends of the market along with a regressive mathematical model that assesses the value based on factors such as capital expenditure, equipment lifespan, R&D investments, and so on. The Solenoid Valves Market demand has been researched taking into account the prominent economies across the different geographic regions to understand their corresponding impact on the market. The Solenoid Valves Market drivers are evaluated for short-term, medium-term, and long-term based on the different market dynamics impacting the market. The Solenoid Valves Market challenges are evaluated for short-term, medium-term, and long-term based on the different market dynamics impacting the market. The Solenoid Valves Market trends have been analyzed taking into consideration the micro and macro trends prevalent in various geographies. The Solenoid Valves Market outlook provides a brief overview of the market performance and anticipated change in market dynamics. The Solenoid Valves Market analysis also involves the identification of new companies that have entered the market scenario and their impact on the market dynamics in the future.